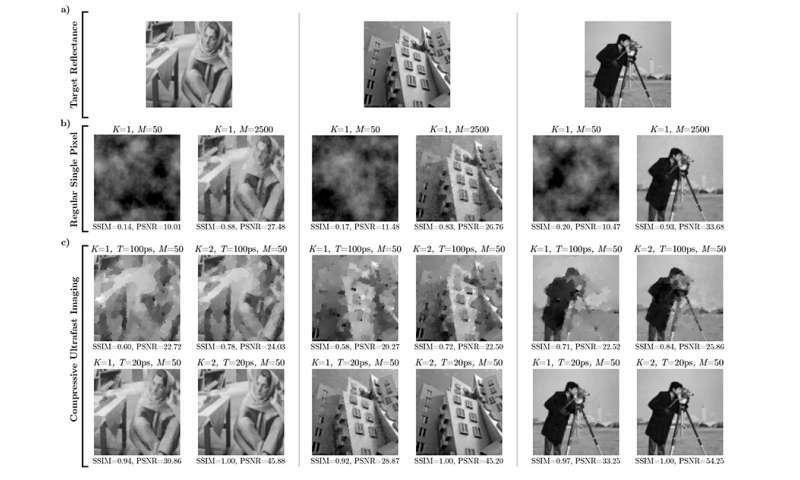 But using compressed sensing for image acquisition is inefficient: That "single-pixel camera" needed thousands of exposures to produce a reasonably clear image. Reporting their results in the journal IEEE Transactions on Computational Imaging, researchers from the MIT Media Lab now describe a new technique that makes image acquisition using compressed sensing 50 times as efficient. In the case of the single-pixel camera, it could get the number of exposures down from thousands to dozens. One intriguing aspect of compressed-sensing imaging systems is that, unlike conventional cameras, they don't require lenses. That could make them useful in harsh environments or in applications that use wavelengths of light outside the visible spectrum. Getting rid of the lens opens new prospects for the design of imaging systems. One of Satat's coauthors on the new paper is his thesis advisor, associate professor of media arts and sciences Ramesh Raskar. Like many projects from Raskar's group, the new compressed-sensing technique depends on time-of-flight imaging, in which a short burst of light is projected into a scene, and ultrafast sensors measure how long the light takes to reflect back. The technique uses time-of-flight imaging, but somewhat circularly, one of its potential applications is improving the performance of time-of-flight cameras. It could thus have implications for a number of other projects from Raskar's group, such as a camera that can see around corners and visible-light imaging systems for medical diagnosis and vehicular navigation. Many prototype systems from Raskar's Camera Culture group at the Media Lab have used time-of-flight cameras called streak cameras, which are expensive and difficult to use: They capture only one row of image pixels at a time. But the past few years have seen the advent of commercial time-of-flight cameras called SPADs, for single-photon avalanche diodes. The reason the single-pixel camera can make do with one light sensor is that the light that strikes it is patterned. One way to pattern light is to put a filter, kind of like a randomized black-and-white checkerboard, in front of the flash illuminating the scene. Another way is to bounce the returning light off of an array of tiny micromirrors, some of which are aimed at the light sensor and some of which aren't. The sensor makes only a single measurement—the cumulative intensity of the incoming light. But if it repeats the measurement enough times, and if the light has a different pattern each time, software can deduce the intensities of the light reflected from individual points in the scene. Time-of-flight imaging essentially turns one measurement—with one light pattern—into dozens of measurements, separated by trillionths of seconds. Moreover, each measurement corresponds with only a subset of pixels in the final image—those depicting objects at the same distance. That means there's less information to decode in each measurement.